First off, I admit that this blog has been lacking on content. I will try and post here more regularly. 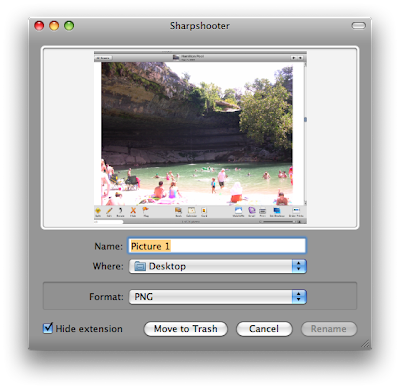 The biggest thing the blog is lacking is any news about Sharpshooter, my Mac screenshot helper utility application. In early September, I put the final touches on Sharpshooter and started selling it online. Before I started Kerlmax, Sharpshooter was a personal side project available as freeware. I got a lot of positive feedback about the app and a lot of feature requests as well. This encouraged me to put some more work into improving Sharpshooter so I put together a plan to start the company and release version 1.0. Because the app was previously available for free, I sold it at a 20% discount of the regular price of $15 for the first month. Unfortunately I really don't know much affect that had on my sales. Most of my sales came in during the first two weeks and everything since then has been slow but fairly consistent, even after dropping the discount. All of this has been with almost no marketing on my part. That's going to change when I release the next minor revision. Hopefully with some press coverage sales will pick back up. Congrats on your decision on starting up Kerlmax and releasing the Sharpshooter app. I take about 20 screenshots a day and the tool is a real timesaver for me. Keep the development up! Now I'm off to your store to buy a license! How can I change the font size when using SS? The font that prints is VERY small. You should probably provide some way to change the font, size etc. Regarding the font size, I'm not sure I understand what you are talking about. Sharpshooter does not print out any text unless there's something I'm overlooking. If you don't mind, please send an e-mail to support@kerlmax.com and I may be able to help you once I determine what it is you are referring to. This app is exactly what I am looking for, but you are dreaming if you think this single piece of functionality is worth $15. Let's put this in perspective—from Apple, the Snow Leopard update is going to be $29. You are changing fully half that for the privilege of being able to automatically rename screenshots? I'm off to the Apple suggestions page—hopefully will be able to get my full value out of Snow Leopard by getting the functionality of your app built in to Snow Leopard instead. At $2, this app would be flying off the shelves. Think iPhone app pricing; think cups of coffee. Volume is where you'd make money on this app. Thank you, Anonymous, for your wonderful business advice. I can understand if you think Sharpshooter is priced too high, but to insinuate that it is 750% overpriced is a first. I can attest that this app is GREAT... it adds functionality that should have been included with OSX from the start. Isaac really impressed me with an early release. The early release had a bug, I emailed Isaac and with hours he personally emailed me a copy of the app with the bug fixed!! As far as the comparison of the app's price to a snow leopard UPDATE, you must also take into account the price of the original product which is updated to get a fair price comparison. You must also take into account that this product is a niche market. I am sure that most people do not even know what a screenshot is, let alone how to take one. (especially not more than one of the multiple ways) You must take into account that the developer is not a multinational corporation, he is a single man who made a useful product that filled a needed gap.